Hello, I am having an issue when I delete a file from my desktop. In a nutshell, there are times when I delete a file from my desktop, that the icon from a different fence will move. 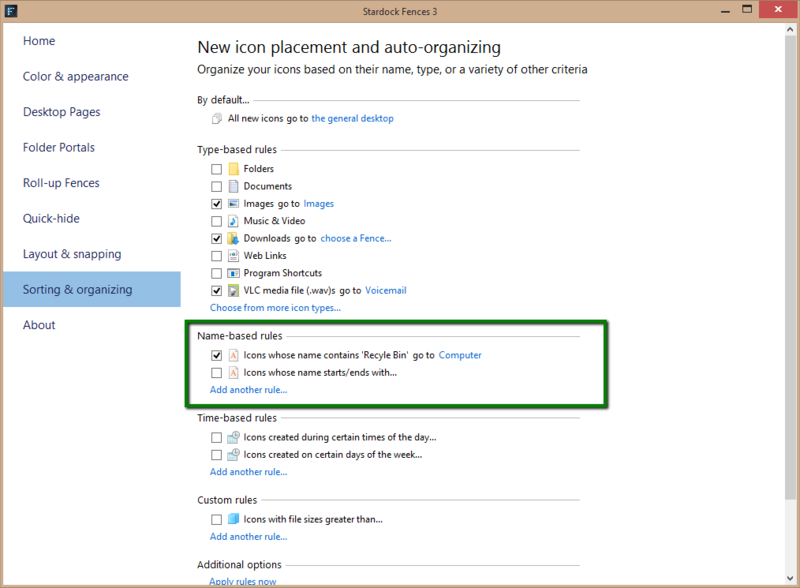 An example would be where I would empty my recycle bin, then delete a file from a different fence, the icon for the recycle bin will move to my fence that I have all new files go to. Does anyone know a fix for the issue? I searched about 20 pages pf posts, and saw one other post about the issue, but no resolution, so I apologize in advance if I missed it. Yeah, same issue I am having here. More or less a bump, and to see that this might be an issue with certain operating systems or software conflicting. I also noticed the issue happens when trying to run an app within a rolled up fence as admin, so it seems like the entire bug is related to the right click context menu. Can you please create a case at http://esupport.stardock.com/index.php?/default_import/Tickets/Submit so we can collect data and find the common cause? I filled out a ticket in January (YFD-214-75876). I talked back and forth with Sean Drohan, and he had me take a video of the issue. He said he would pass it along to the development team and couldn't give me a time frame for resolution. I was hoping that the issue would be taken care of in v3.0, but unfortunately not. This is on a fresh install of Windows 10. I literally don't understand how more people aren't having this issue, either that or they are just putting up with it since its an easy fix every time it happens. Ive already made a support ticket a while back, and no solution was found. I know it's a work-around, but have you tried creating a Fences rule that moves any icon named "Recycle Bin" to your [Computer] fence? The issue isn't just the recycle bin. It's any folder or program that I use. It's also not just that it moves, there is a name change issue along with it. An example would be if I open Microsoft Excel and create a spreadsheet. If I save it to the desktop, and then rename it, the icon for Microsoft Excel will also be renamed to whatever I named the spreadsheet. +1 ...i'm having all sorts of icon issues on my desktop / within the fences. I've gotta be extra careful deleting something because numerous things can end up in the recycle bin.